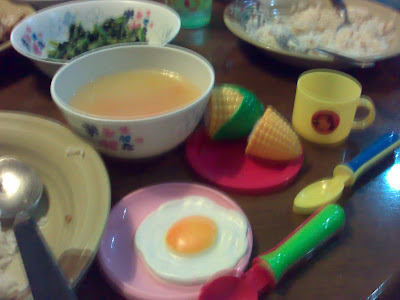 William prepared the corn and Meimei fried an egg. I am not sure who taught them to, but it is as pleasant to eyes as it is to my heart. Tonight, 加菜。Usually I keep my stomach half filled at dinner but this evening it is 120%. I am not sure women are meant to cook, but home cooked meal is one sure way to win a father’s heart. I shall postpone my date with my desktop for a paradise moment. Is it global warming or human conscience, which drives heat wave through brain, forcing them to run down the cheek? I cannot fathom the sensation. More than often, I overlook small event that pleases me more than gaining knowledge, or career achievements. I am made out of love, not work. It is not clear to me when my day will come to pass. I am quite sure many home cooked meal awaits me, keeping me long to be reborn, as a father again. It is the food, but I know, it is not. The egg and corn is getting cold now. They still smell as good as combination of hundred meals I have had.